This is a list of the album titles from left to right: 1967 The Piper at the Gates of Dawn, 1968 A Saucerful of Secrets, 1969 More, 1971 Meddle, 1973 Dark Side of the Moon, 1975 Wish You Were Here, 1977 Animals, 1979 The Wall, 1983 The Final Cut, 1987 Momentary Lapse of Reason, 1994 Division Bell, and 1995 P.U.L.S.E. In 1965 the band started out with the name "The Abdabs". The line-up was Roger Waters, Clive Metcalf, Richard Wright, Nick Mason, Juliette Gale, and Keith Noble. Juliette and Wright married, so she, Noble, and Metcalf all quit the band. Syd Barrett was hired and the name of the band was changed to Pink Floyd, which came from the two blues artists Pink Anderson and Floyd Council. Syd was really bad into drugs so they hired an additional guitarist, David Gilmour, and eventually fired Syd. Then Wright was put out and Waters left the band. Now there was just Gilmour and Mason and they went on to make more albums under the Pink Floyd name, which they were sued by Waters for. The band had some line-up changes and continued to make albums up to 1995. Ritchie Blackmore was with Deep Purple for about seven years before forming his own band. The line-up in 1975 was Blackmore, Ronnie James Dio, Craig Gruber, Mickey Lee Soule, and Gary Driscoll. 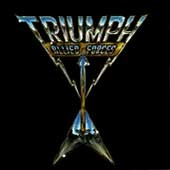 In 1976 the line-up was Blackmore, Dio, Jimmy Bain, Tony Carey, and Cozy Powell. This line-up stayed constant until 1978 when the line-up was Blackmore, Dio, Bob Daisley, David Stone, and Cozy Powell. In 1979 the band changed again producing Blackmore, Graham Bonnet, Roger Glover, Don Airey, and Cozy Powell. Then in 1980 the line-up was Joe Lynn Turner, Blackmore, Glover, Airey, and Bobby Rondinelli. In 1982 the line-up changed again: Blackmore, Turner, Glover, Rondinelli, and David Rosenthal. In 1983 the line-up was Blackmore, Turner, Glover, Rosenthal, and Chuck Burgi. After 12 years Blackmore reformed the band and the new line-up is Blackmore, Doogie White, Paul Morris, Greg Smith, and John O'Reilly. 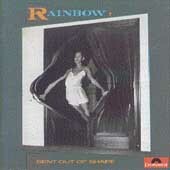 Rainbow's first three albums "Rainbow", "Rising" and "Long Live Rock n Roll" with Dio singing are also three of my most favorite albums. Man on the Silver Mountain has to be a classic song. This is a 70's cult band that never made it big in the U.S. but did in Japan years later. They released their classic album, "Fire Down Under", one of the best early 80's metal albums. They are still around making good music and their most recent, "Inishmore", was released in 1998 under Metal Blade Records, and sounds really good. The current line-up is Mike DiMeo, Mark Reale, Mike Flyntz, Pete Perez, and John Macaluso. Riot's "Fire Down Under" should be a classic, It's really a great album from the early 80's. The album, "Inishmore" is a great 90's album and the band sounds better than ever! The guitar work is excellent and the album sounds very clear, probably the best produced and should be in every metalheads collection. This is a Canadian band that started out in 1968 with Alex Lifeson who got together with Geddy Lee and John Rutsey. In 1974 Rutsey left and Neil Peart joined the band. Besides being outstanding musicians Rush is also very giving. They support the organization, "Artisits Against Racism", and also give proceeds from their concerts to charities. The band is also a member of the "Order of Canada", the only rock band in history to receive this honor. Rush is one, if not the best Progressive Rock Metal band ever to come along. These musicians are three of the greatest around. They have been playing together for three decades now, which is amazing in itself and over the years they have created many great albums. Some of my all-time favorite albums are: Fly By Night, Caress of Steel, Moving Pictures, Presto, Counterparts and Test For Echo. In my opinion Exit Stage Left and A Show of Hands are two of the greatest Live albums ever created. Rush are truley one of the greatest bands! They have released their 2002 album, Vapor Trails, and will begin a world tour. Keep up the great work Rush! ~The Trooper. 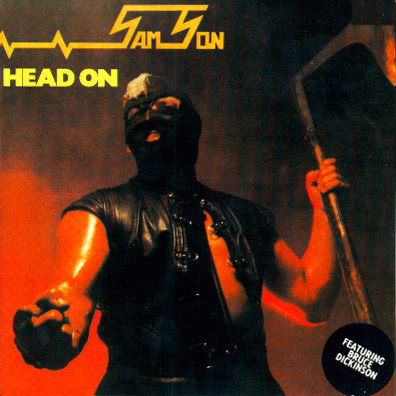 Samson was one of the first NWOBHM and the band that Bruce Dickinson was in before Iron Maiden, although he only made two albums with them, "Shock Tactics" and "Head On". Both of these albums are classics and Samson could never get their act together after Bruce left. The current lineup consists of Paul Samson on Guitars/Vocals and Chris Aylmer-Bass. 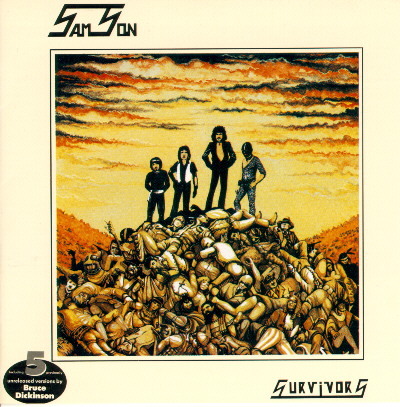 Savage, also like Samson was one of the first NWOBHM bands. 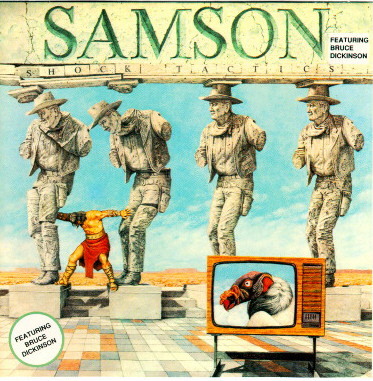 They were not as popular as Samson but their still around today playing the same style of music. The bands last lineup was Chris Bradley-Bass/Vocals, Andy Dawson-Guitars, & Richard Kirk-Drums. This English metal band started out with the line-up of Graham "Oly" Oliver, Steve "Dobby" Dawson, Paul "Blute" Quinn, Pete "Frank" Gill, and Peter "Biff" Byford. The band hit the charts in the UK and were popular in Japan. They are still around and in 1997 released their newest album titled "Unleash the Beast". This Canadian band formed in 1975. They are similar in many ways to Rush. They weren't well known until after the release of "Progressions of Power". The bands line-up was Rik Emmett, Gil Moore, and Mike Levine. In 1988 Emmett was replaced by Phil Xenides. In 1976 Eddie and Alex Van Halen together with David Lee Roth and Michael Anthony formed the band Van Halen. They had good luck from the beginning and were noticed by Warner Brothers and are one of the most popular metal bands. In 1985 Roth left the band to start a solo career, which didn't go well, and Sammy Hagar was soon aboard. In 1995 unfortunately Hagar left Van Hagar and rumors spread that Roth was coming back. Instead Gary Cherone (formerly in Extreme) has joined the band. My two favorite Van Halen albums are "Fair Warning" and "5150". I think they are the best the band ever made and the only two Ive ever really liked. Whitesnake formed in 1978 in London by Ex- singer from Deep Purple, David Coverdale. The earlier albums were mainly big in Japan and Europe, but by 1984 the band was much more energetic and their albums became enormous in the USA selling 6 million copies. After 1989 Coverdale reformed the band and the famous Steve Vai joined. Sadly, in 1998 Cozy Powell died in a car crash. Y&T was origionally called Yesterday and Today and they originated in San Francisco. The bands earlier music was promising and heavy but the later albums became more poppish. Y&T disbanded in 1991 and returned in 1995 for a short time before disbanding again after "Endangered Species". The bands last lineup consisted of: Dave Meneketti, Stef Burns, Phil Kennemore, and Jimmy DeGrasso.